Jacob Fielding can’t die. He can’t even suffer injury. His foster father transferred this amazing power to him just before they crashed into a tree, killing Mr. Fielding instantly. But while being indestructible sounds great, it has a darker side, as Jacob and his friends Milo and Oh (short for Ophelia) discover as they try to understand the power, then use it to help people. Death can’t be defeated; put on hold it lies in wait. And the three teens find that there is a terrible price to pay for trying. Patrick Carman has a knack for writing gripping stories with lots of teen appeal. The straightforward writing style, combined with a dark and creepy story and credible teen characters, should make this a win with reluctant readers. Yet there’s enough depth and character development to also appeal to good readers who enjoy a creepy story. I like that Jacob, the narrator, is just an ordinary teen boy who does the kinds of things that teens do, like trying to impress the girl. Mr. Fielding never explained the power to Jacob, and as the three friends struggle to understand the “black lion,” as they call the power, they make mistakes that they will have to pay for in the end. 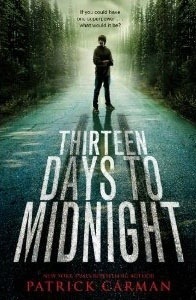 Thirteen Days to Midnight was a 2010 Cybils nominee in the Fantasy & Science Fiction—Teen category. Sounds great. I really like Patrick Carmen as an author. I'll have to add this to my list. Oh, good. He does do some good work. I was excited when I saw that Carman had another book on the market! Thanks for the review!